The last few years I’ve been unable to attend the FPA annual conference due to personal commitments. It was great to be back on site for this year’s event in Chicago. As an Official Sponsor of the Next Generation, we are tapped into what young advisors are doing, hearing, and saying. It’s an energizing group to be around—the future advisors I met in Chicago view financial planning as a calling as well as a rewarding career. It does strike me as a bit ironic that the “NexGen” community stops at 37 years old, when the average age of a graduate in a financial planning program (as shared during a conversation with university staff) is 41. I suspect these more seasoned career changers will have an easier time making their way into the industry, but it’s important to incorporate the youngest professionals into existing businesses, as they will impact the industry for decades, if they don’t get discouraged. This new generation of advisors are more dynamic and driven than they’re often given credit for, and these savvy younger professionals will continue pushing the status quo to create opportunities for themselves. Brown, Caleb. 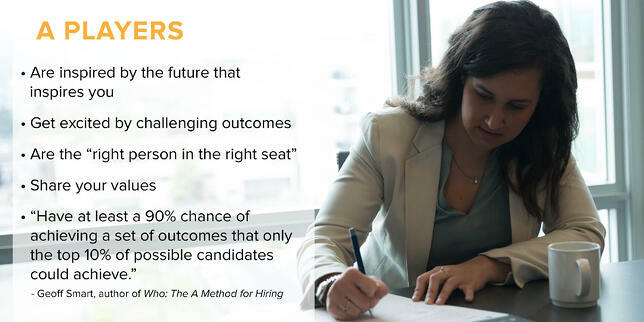 Successful Hiring for Financial Planners: The Human Capital Advantage. Coventry House Publishing, 2018. Many small financial advisory firms don’t have a Human Resources Department. So when it comes time to seek out, hire, train, and develop employees, those tasks usually fall to the owner. They must figure out where to find candidates, what to ask in an interview, how much to pay, how to set up a training plan, and how to keep them engaged and motivated. That research takes valuable time away from the owner’s other obligations and productivity. The foundations for FP Transitions were laid in 1999, and that makes our company officially 20 years old this year. I founded this company thinking that I knew a lot more about running a business than I actually did at the time. Armed with a law school diploma and a lot of energy and drive, I thought I was ready to conquer at least a small corner of the business world. Turns out that running a business takes experience and business knowledge. Along the way, I picked up an important axiom from a local legend who said, “Don’t confuse activity with achievement.” He was right, but it took me a long time to understand the difference. In retrospect, the first ten years of our company were characterized with a lot of activity; the last ten years is where the achievement took place. The difference maker for us was hiring an outside CEO, Brad Bueermann, to come in and help us turn our activities into achievement on a national scale. Until then, I confused being very busy with being very successful, or at least constantly being on the verge of success. Everything revolved around me and the lawyer in me silently rejoiced. But this wasn’t a good, long-term model because eventually I ran out of time and energy. And I got older! Advisors often mistake activity for achievement too, thinking that their one-owner practice that is 90% or more fee-based and that grows steadily at 10% or more every year is proof that they have built a business and that success has been achieved. I see a lot of independent advisors building what I call “books” and “practices,” but not very many building sustainable businesses. What I’ve learned over the past twenty years is that, while it is incredibly satisfying to have a practice that revolves around the founder, that isn’t a durable model, and it is not “a business.” At some point, if a practice is to outlive its founder and provide services to the clients for their lifetimes, and not just for the length of the founder’s career, significant changes need to be implemented, and the sooner the better. Early on, we grew fast and I became totally focused on our top-line success and growth rate. But there came a time when it was clear that without strengthening the foundational aspects of our business, it would never grow past a certain point. I had to move myself out of the center of operations and learn to build and run a business like a shareholder, not like the star attraction. Making myself a part of a stronger, more diverse, and younger team of professionals was hard, but very necessary – more than just changing my leadership style, we had to change the culture of our operation and, frankly, that was beyond my skill set. So, we brought in outside help – people who knew things that I didn’t – and that made all the difference. Looking back over the past few decades, you can easily spot the trends and physical changes in our industry. Since 2000, when FP Transitions formally opened its doors, I’ve seen our profession, especially in those working under an independent broker-dealer or hybrid model, steadily shift to fee and advice-based solutions. Early on, most practices that we represented were made up primarily of transaction or non-recurring revenue; today advisors build businesses with a focus on fee-based income streams. Independent insurance companies are evolving as well with a sophisticated and wide array of recurring revenue. Along the way, these practices have become not just more valuable, they are also physically larger and stronger. This requires more qualified people to analyze, give advice, produce revenue, as well as the adjunct talent to support these professionals. Looking forward, we see an ever increasing need to recruit and retain the best talent in the industry to support not just where your practice is today, but where that growing business will be ten years from now. Everyone has read about the need for recruiting; but the story has shifted in the past few years and will continue to do so going forward. Rather than simply hiring next gen talent as the need arises, this could well turn into a fierce competition to adequately reward and retain that talent as more and more advisory businesses reach the next level of success and draw upon a talent pool that has scarcity written all over it. Successful, ambitious, and conscientious advisors ask questions like: How do I create next-level growth? What will it take to build a firm that delivers an extraordinary experience to my clients and their families? How am I going to achieve my own next-level life? The answer starts with another strategic question: What has to happen to give you the freedom to focus on precisely those aspirations? Your catalyst for growth in all three areas lies in the talents of your team. Make your A players your #1 priority and you’ll have an alchemy that expands your available time and transforms exhaustion and obstacles into more space and energy. treat them like your best clients. Your firm’s succession plan is designed to gradually transition ownership, leadership, and growth responsibilities to the next generation of advisors. The goal is sustainability of the firm, and it is accomplished through a plan that coordinates the changing roles of the founder(s) and the successor team over many years. Selling equity in the business in a series of steps or “Tranches” gives both the founder and the next generation of owners the time to wisely manage the transition and to prepare for the changes to come. The transfer of ownership from the founders (G1s), to the second and third generation of owners (G2s and G3s), starts with Tranche 1. Tranche 1 is usually a shift of 10% to 20% of ownership to the next generation. Tranche 1 is often called the incubator stage and allows for all parties to test the waters and to prepare the business structure for the journey ahead. The second step, Tranche 2, tends to move ownership to 70%/30% or 60%/40%, with G1 retaining the majority ownership position. The tranche system – selling to G2s and eventually G3s – not only widens the ownership base but also provides increasing continuity support as the firm develops and the successor team comes together. 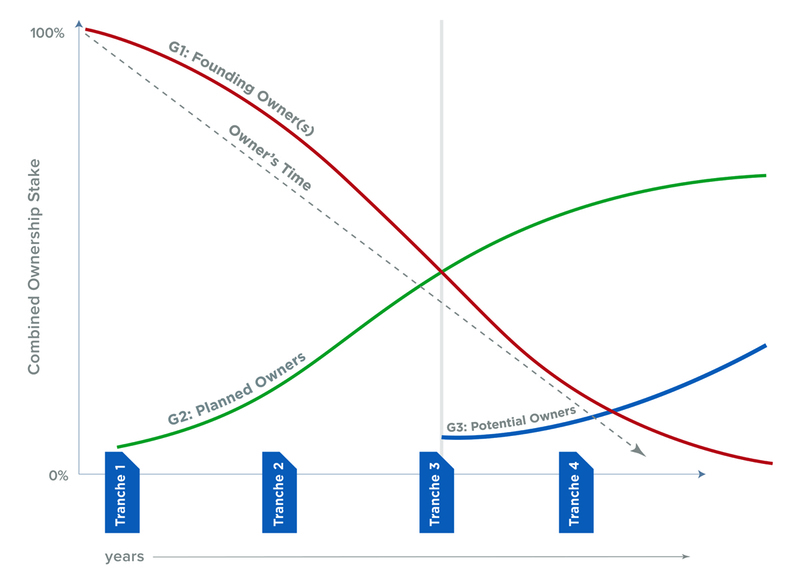 As our clients progress through Tranche 1 we are often asked, “When should we start Tranche 2?” And the answer is: It depends, but also know that Tranche 2 tends to start well before the final payments are made by the G2 owners in Tranche 1. Succession Planning in the Family - Simple or Difficult? Business succession from parent to child is an age-old practice in human history, from humble cobblers to royal families. The practice stemmed from necessity—parents taught their children the trade they knew in an effort to teach them to survive. What started from necessity became custom and, eventually, tradition. In many professions, this tradition is still a point of pride. Advisory business owners will often see this as the best path to build an enduring practice and retain their client base. For some advisors, the idea of passing the business to a family member is their preferred choice and seems to be the easiest path forward. One day, the founder steps out and the child steps in. Most advisors even consider gifting their business to their children, with or without a written contract, rather than selling it to them. Here are some simple reasons you should think twice before taking this route. Many advisors think, “I’ll just give my children the business when I’m ready to retire.” We hear this all the time from founding owners whose children work with them in their business. Be wary, though – although certain types of gifts are exempt from this rule, generally speaking, a gift whose value exceeds the annual exclusion is taxable to the giver of the gift and likely will be applied against the giver’s lifetime estate tax exemption. In many professions and in most businesses, succession planning and sustainability are not pressing issues. Most people don’t need a multi-generational dentist office, for instance. Who really cares if the neighborhood hamburger stand or your favorite restaurant has a succession plan? But in the financial services and wealth management industry it’s different. Advisory clients have a clear–and not unreasonable–expectation of receiving continuing advice and investment management tailored to the length of their lives, not to the length of their advisor’s career. Being an independent financial professional necessarily indicates a commitment to the future; the element of planning implies that a financial advisor is starting something that will not and should not end with his or her own career. Consider the average successful financial advisor is in his or her mid-50’s. At that age, the owner/advisor will likely continue to work for another 15 to 20 years, even as time in the office gradually diminishes over the last half of that plan. At this time, clients are transitioning into retirement and are likely to need more financial guidance, not less. The term “succession gap” refers to the time difference between a single financial advisor’s career length and a client’s wealth cycle.